it's love when I walk into a room and see them. If you are against painting over wood- you might not want to read any further. even with the windows and doors open. They were so cold and dreary. Even though the rooms were all very large- they felt so small and closed up. In the kitchen. In the bathroom. In the hallway. In the bedrooms. In the cottage. Even on the only finished ceiling in the house and in the cottage. the look of that knotty pine was taking over. but I didn't hate them either. and they are thick- thick- thick pine-and original to the house. I knew that a few (gallons) of paint and primer would take them from dreary to delightful. If you are planning to paint your wood walls- just remember do not skip the primer. I would ask at your local hardware store for a recommendation. in planks of grooved pine. you have to go with what makes you happy. Creamy white walls, french doors and double chandeliers. and that definitely makes me happy. so I am feeling an inspiration post about choosing the 'perfect' white paint coming up. beautiful whites with different undertones and variances. moves up to the front of the list. Specccccccctacular. And I love how you arranged your plates! Hi Courtney Something went wrong as I was halfway through writing my comment so I'm not sure if it got posted or not. So I am commenting again just in case. 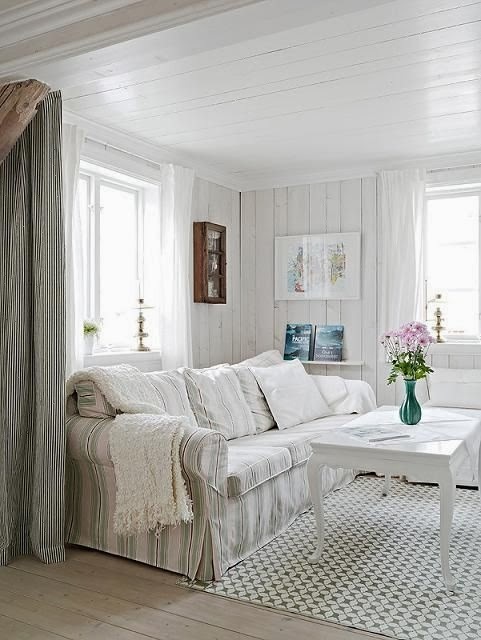 I love the look of knotty pine painted white. I remember in the 60s that my mom painted our knotty pine white which was very daring back then. Everyone thought she was crazy, but of course it looked great. Yours does too. Your home is beautiful. Asshhh.. takes me back. I grew up in a home with painted knotty pine walls and dark mahogany floors. Bead board ceilings and wainscoting. A look I would luv to return to... Luv tour painted walls. So much nicer painted white. It totally transforms the rooms. Beautiful! Every time I see your buffet a deux corps I am overcome with lust and obsession! Wherever did you find that wonderful piece? I am not a fan of the knotty pine. As you show the dinning area before I would have pulled that all out and started over, however, I REALLY like the white. I think in the past for me knotty pine has always looked too yellow and dark but I really like it white as you have it! I LOVE that animal print stool! Thanks for sharing. It looks just beautiful. Lovely! I have a den that has the thick old knotty pine, and I've been living with it in wood as I have updated other rooms with paint. Eventually, I plan to paint it as well. The ceiling is wood in my room, which I will probably leave in wood, but the walls and trim have GOT to get lightened up! Thanks for showing the before and afters - so inspiring, Courtney! That's amazing. Your before and after is quite an improvement. I don't blame you for painting it all and I think it's great that you left the wood instead of changing it to drywall. That had to of been a lot of work! Do you recommend doing planks horizontally or vertically? I would LOVE to add them to my home in some places, but I don't know which way to go - I have to add that I usually want the long term choice - not a fan of trends. One thing to consider is the placement of the wall studs. If you run them horizontally, it shouldn't be a problem. If you run them vertically, you will more than likely have to add some extra studs to give you something to affix them to. I like planked walls both ways but probably prefer vertical. In my experience~ if the boards are vertical- they give the illusion of higher ceilings and make your room 'feel' taller. Horizontal- makes it feel a little wider. Purely your preference on look- they are both charming!! 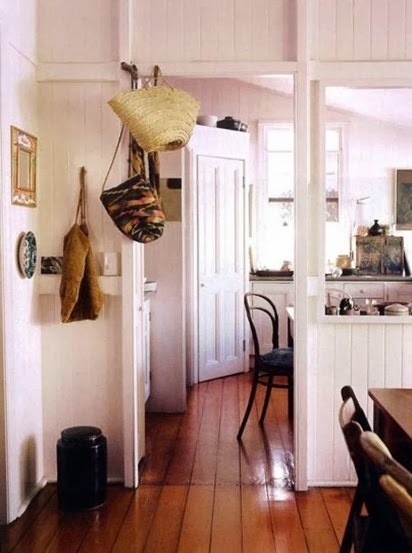 These are original and were put up in the house in the 1940's- so I like to think of them as fairly classic instead of a trendy- even though planking walls has recently been something that has become popular. I really like the white in your studio office. You said it has a pink peach undertone and I can see it in your photo. Do you mind sharing the color? I live in a knotty pine world. Unfortunately, my husband likes the knotty pine and doesn't want the walls and ceiling painted. I'll bring him around to my way of thinking one way or another. Either he'll come around to my way of thinking and help me paint, or I'll paint and he'll learn to love it (or live with it). :D I'm really looking forward to your thoughts on choosing the right white, but I love the wall color in your living room now, to. I am looking forward to hearing and seeing what white paint you choose. That is always the most difficult decision for me. I have painted knotty pine and regular wood paneling several times and never once regretted my decision. I just love the look of painted wood on the walls. You're right, though - the priming is essential! But the final look is oh-so-divine!!! Love the inspiring photos. I lived in a totally knotty pine house, rental, many years ago. ..even the closets and ceilings!! I thought I'd go "knotty". ...myself. I grew to hate it! Your look is gorgeous. We have old knotty pine in the dining room that my husband REFUSES to paint! I am going to sit him down into the computer chair and WHEEL him over to the computer and show him your post! I have always considered those walls ugly ducklings that could turn into a beautiful swan! You've done wonders with your home! I grew up in a house with a knotty pine den. It's beautiful and you have to respect its beauty but painting your walls completes your charming surroundings. Lovely! Our breakfast nook has the old knotty pine and was one reason we bought the house - it suited us back then. Now we are thinking a white wash would brighten it. I think you may have convinced me with your lovely rooms. 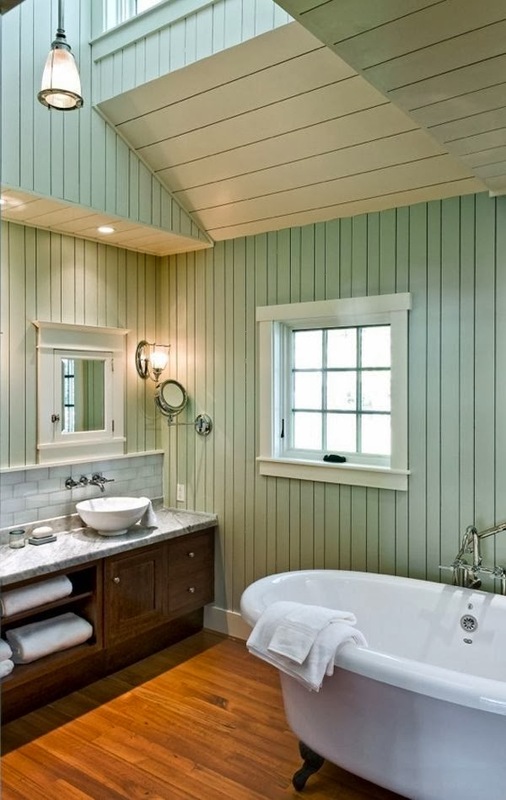 I love painted plank walls and panelling. I love the texture and the dimension it adds to the walls. The old stuff is the best, by far, but if you look around you can find good quality new planks, too. Great post! White makes everything more beautiful. Your before photos make me feel claustrophobic too! I love all the plates on the wall, not to mention two gorgeous French chairs. Thank you for sharing. great inspiration. Wow! I love knotty pine but your redo is incredible! Congratulations on a beautiful new space. When we built our cottage in 2007-08, I wanted to nail wood planks directly to the studs (we insulated). But the building dept. wanted sheet rock first. Now I'm looking for planking, bead board, etc. LOVE the look of creamy white panels... and I love that you post your 'before' pics, Courtney ~ it's inspiration to keep me going! Hi Sweetie, I am right there with you. Dislike knotty pine immensely. Love the peachy white shade in your office. Do you remember the name of the color you used. I find it is so hard to find a very light pinkish white that I like. Your peachy one is so nice. Just gorgeous, that first image makes me swoon! I really like the painted pine, and it really works with your style. Your home is beautiful. I love it. Love it! I've even pinned or should I say "pine-d" it for future reference! Oh I'm so hoping my outcome is just a quarter of yours - it's all so gorgeous ! STUNNING!! Love love that first shot!! I love the look of a light and bright paneled wall...yours are just gorgeous...I had a large sunroom in a previous home that had those dark panels on the ceiling...it took a while for me to convince my hubby to paint them...once painted, "he saw the light" and loved it..
Love seeing your gorgeous rooms Courtney!.. I lived in a rental house that had pine walls, and it made the house feel very cramped and small--would have loved to have painted over it, but couldn't because it was a rental. Our current house is light and bright inside--makes me happy! That is such a dramatic before and after of your dining area--amazing what paint can do! My sister owned a beach cottage at Myrtle Beach, S.C. 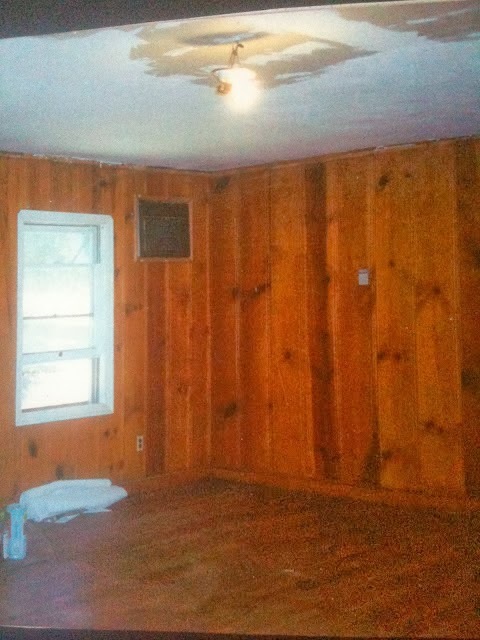 It was totally knotty pine--walls and ceiling. It was so oppressive you felt you were being smothered. I use to look at it and imagine how beautiful it would be all painted white. I love the painted walls! I'm all for painting over paneling. Just not in white (unless you're doing wainscoting). White walls are my pet peeve. Too sterile looking for me. I love the bathroom w/the pale robin's egg walls though. This is like fate. I just decided that I am going to plank the whole house. I have the typical ranch home with no architectural details. I have to admit I am a bit nervous. Originally I thought I would put up the planks horizontally but there are some rooms that are very wide with low ceiling. Do you think it would look weird if a living room has vertical planks then other rooms have horizontal planks? My dining room was knotty pine in my big old 2 story home and it felt dark and depressing! I wanted to paint it, but my hub Loved the dark wood and like so many men, opposed to painting wood! Lol! Our darling daughter and husband bought our home and she got the thumbs up to paint it form her hub and it turned out so fresh, bright and cute as a button! Yay for painting wood! The plank painted is so pretty and truly brighten's up the whole place. I love what did. I LOVE it! I'd too feel claustrophic with those dark walls. I love your dining room. Would you share what kind of plate hangers you used. I am not a fan of the old kind where there is hooks on top and bottom.